Breastfeeding has many well-established benefits. Babies who breastfeed have lower rates of infection, obesity and diabetes. Mothers who breastfeed have lower rates of postpartum depression, type 2 diabetes and some types of cancer. The World Health Organization and American Academy of Pediatrics recommend exclusive breastfeeding until a baby is 6 months old. US studies show that about three-quarters of mothers start breastfeeding, but less than half are still breastfeeding when their babies are 6 months old—and only 16% are exclusively breastfeeding at 6 months. Certain groups are less likely to start breastfeeding their babies and maintain it, including African American, low-income and less educated mothers. Efforts to encourage and support breastfeeding include “Baby Friendly” hospitals, breastfeeding policies in the workplace, and breastfeeding classes for parents. Classes for parents before their babies are born, and immediately afterward, have been shown to increase rates of breastfeeding. However, it is not clear whether breastfeeding classes are supporting parents from diverse backgrounds. In November 2013, the C.S. Mott Children’s Hospital National Poll on Children’s Health asked a national sample of parents with young children (0-3 years old) whether they had attended a breastfeeding class. Overall, one-quarter of parents with a child 0-3 years old report having attended a breastfeeding class. In this group, 56% are women and 44% are men. Among first-time parents, 40% attended breastfeeding classes. This poll found that uninsured parents were less likely to have attended breastfeeding classes than those with private or public insurance. Only 12% of parents without insurance attended breastfeeding classes, compared with 28% of parents on private insurance and 29% of parents on public insurance (Figure 1). There were no differences in breastfeeding class participation rates related to parents’ racial/ethnic backgrounds, household income level or education level. 26% of all parents with a child age 0-3 report having attended a breastfeeding class. 40% of first-time parents attend breastfeeding classes. 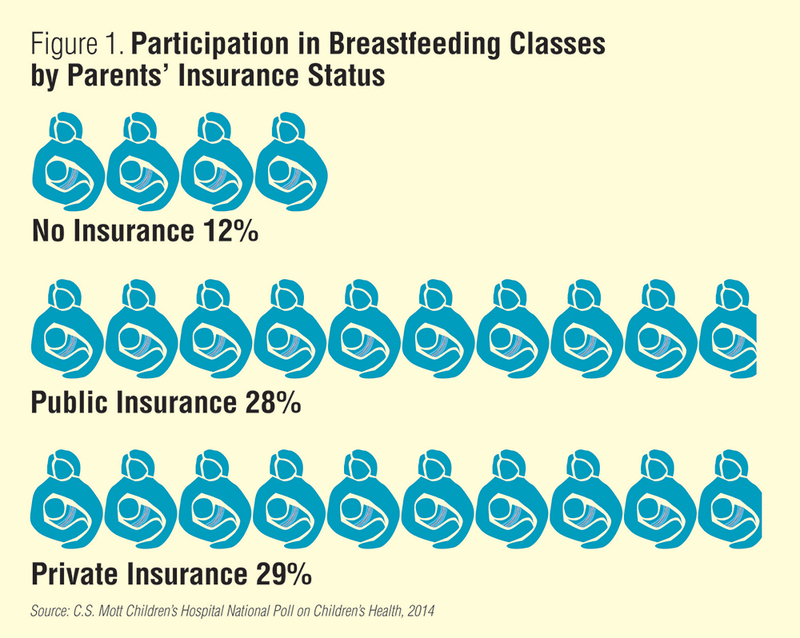 Only 12% of uninsured parents attend breastfeeding classes. Breastfeeding has many benefits for mothers and their children, and therefore it is strongly encouraged by many health professionals and public health officials. However, breastfeeding rates in the US are far below target levels. In this Poll, we examined participation in breastfeeding classes as a window on why rates of breastfeeding are low. On the positive side, 2 out of 5 first-time parents are participating in breastfeeding classes. This finding indicates not only their level of interest but also the availability of the classes. Advocates of breastfeeding will likely be encouraged that there were no differences in breastfeeding class participation related to parents’ racial/ethnic background, income level, or education level. However, parents who were uninsured at the time of the survey were substantially less likely to have participated in breastfeeding classes than other parents who were insured—whether through private insurance plans or public programs. It is not clear what the insurance status of the mother or parents was at the time that a breastfeeding class may have been offered to them. However, we know from other studies that uninsured parents of young children were likely uninsured before the pregnancy, too. That means that, even if the mother was covered with Medicaid during the pregnancy, the parents may not have been as familiar with how to access special benefits like breastfeeding classes that are often offered. Prior studies have shown that African Americans, low-income and less educated mothers are less likely to breastfeed, while this poll shows no difference in breastfeeding class attendance by racial/ethnic groups, income or education. This suggests that, even when parents attend, breastfeeding classes may not be meeting the unique needs of all parents. Future studies are needed to find out which breastfeeding classes are most culturally relevant and are most successful at promoting breastfeeding. Overall, low rates of breastfeeding class participation among uninsured parents raise questions about access, support, and navigating services during pregnancy for parents without coverage, or whose insurance coverage is inconsistent. To be more successful at supporting breastfeeding, classes must be accessible and affordable to all parents. This report presents findings from a nationally representative household survey conducted exclusively by GfK Custom Research, LLC (GfK), for C.S. Mott Children’s Hospital via a method used in many published studies. The survey was administered in November 2013 to a randomly selected, stratified group of parents 18 and older with a child age 0-3 (n=452) from GfK’s web-enabled KnowledgePanel® that closely resembles the U.S. population. The sample was subsequently weighted to reflect population figures from the Census Bureau. The survey completion rate was 54% among the parent panel members contacted to participate. The margin of error is ± 5 percentage points and higher among subgroups. Davis MM, Moniz MH, O'Connell LK, Kauffman AD, Singer DC, Gebremariam A, Clark SJ. "Breast is best" but uninsured parents take breastfeeding classes less often. C.S. Mott Children's Hospital National Poll on Children's Health, University of Michigan. Vol 20, Issue 3, February 2014. Available at: http://mottpoll.org/reports-surveys/%E2%80%9Cbreast-best%E2%80%9D-uninsured-parents-take-breastfeeding-classes-less-often.